The first full weekend of fall will be busy in my castle. I don’t need an excuse to make changes to my lovely abode, but a new season always seems like a great time to do so. 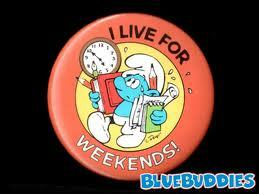 What’s on the weekend warrior agenda? Something old. Something new. Nothing borrowed, and certainly something blue. Painting, painting, and more painting. Touchup painting to a few areas in the kitchen, first floor bathroom, and the staircase leading from the foyer to the second floor is a high priority, since the current weather permits leaving windows open for prolonged periods of time. If the mood strikes me, one of my lucky children will get their room painted! After I finish wielding an array of paint brushes and rollers and splashing colors here and there, I’ll finally get around to finishing the kick-plates that were never stained and sealed from our kitchen makeover nearly 18 months ago. I stained them last week, but just couldn’t seem to find the time to seal them. I’m sure I HAD the time, but who knows what I actually did with it. Grout will finally make it to a few places in the backsplash that never received it. We were so ready to be able to use our kitchen after it was out of commission for 5 weeks, little things like this fell by the wayside. Now is the time to get started on finishing. My husband will take care of replacing the baseboards in the first floor bathroom. I’ll try to talk him into getting crown molding for the family room. We’ve taken on many projects with no prior experience, but mistakes in crown molding installation could be costly, so we will proceed with caution if this is a project that we decide to undertake. The laundry/storage room is in dire need of a deep cleaning and purging. Our typical schedule is twice a year or so and we may be overdue. All hands are always on deck for this particular task! Luckily, for my 13-year-old son, he’ll be away at a teen retreat with fellow churchgoers. Maybe we’ll save some of the load for him. Surprise! I started placing fall decorations in various rooms last weekend and imagine that I’ll continue working on that project until everything is in place. I think I’ll peruse a few decorating web sites and stop by a few home decor stores to get some ideas – and a few treats that are on sale. Grocery shopping is another item on my to-do list. Completing the shopping list, checking out the sales papers, and trying to find a few coupons will take a bit of time. Friday-night activity if I want to hit the stores by 8 AM on Saturday. Never mind that I my youngest one has a Funky Friday event (it’s a church thing) at the bowling alley tonight. Somehow, I’ll make everything happen. I love a challenge! Sunday’s agenda always includes going to church, and sometimes it involves experimenting in the kitchen. Let us not forget about one of my favorite Sunday activities in fall – football! Yep! It seems like I’ll have a busy weekend, but I love taking care of my family and our house, so I wouldn’t change a thing about my weekend plans!